Heat oven to 425ºF. Place 1 pie crust in 9-inch glass pie plate as directed on box for One-Crust-Filled Pie. Unroll second crust on work surface. With floured 2 1/2- to 3-inch and 1- to 1 1/2-inch leaf-shaped cookie cutters, cut 3 leaf shapes of each size from crust. Set aside. Cut remaining crust with scissors to resemble crumb topping. 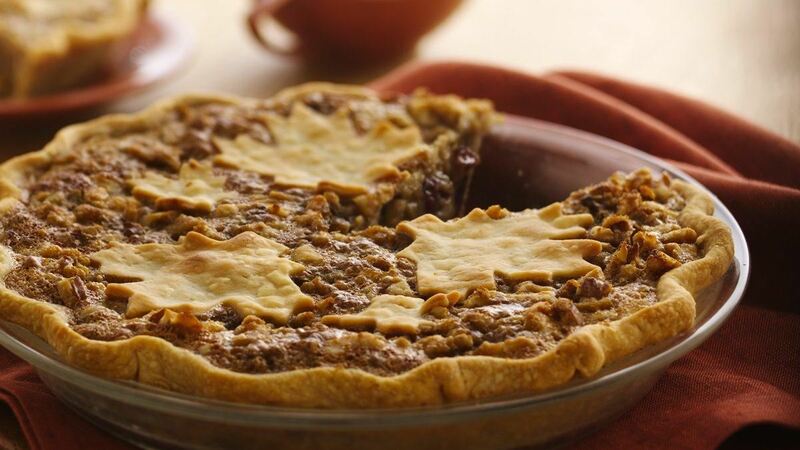 In small bowl, mix 1/3 cup brown sugar and 1/4 cup walnuts; stir in cut-up crust. In 3-quart saucepan, place 3/4 cup brown sugar, the white chocolate chips and syrup. Cook over medium heat, stirring constantly, just until chips are melted and mixture is smooth. Stir in half-and-half and eggs until well blended. Stir in cranberries, 3/4 cup walnuts and the raisins. Pour mixture into crust-lined plate. Sprinkle with cut-up crust mixture; top with leaf cut outs. Cover crust edge with 2 to 3 inch strips of foil to prevent excessive browning; bake 20 minutes. Remove foil; reduce oven temperature to 350ºF. Bake 20 minutes longer. Cool at least 2 hours before serving.